From Derby, Maine to Fenway Park in Boston may as well have been a million miles away as a youngster from Derby back in 1959. 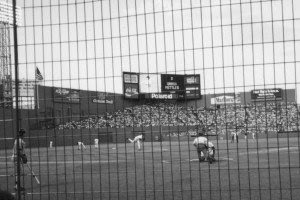 The photo shown here that I snapped is like a dream sequence, and was taken years later as I sat 5 rows back behind home plate at Fenway Park. In the 1950’s watching a game on a black and white television was the closest I could ever imagine to actually being there. The original photo was in color, yet like many photos and illustrations used for Growin’ Up in Maine, I prefer aging pix by presenting them in black and white. Out of 8 children including 3 younger than me, I was the last to step on soil outside the state of Maine. At one point I was the only child in our family who had never been to Canada, too, and that first trip was as an adult. By age 18 the only foreign visit was one school band trip to Keene, New Hampshire for a high school football game. We were invited to represent the home team. Just the opposite of Milo High School, they had a football team and no band. The Fenway trip years later with my wife to watch the Boston Red Sox in person was better than I could imagine. The party atmosphere and unique aroma of the outdoor food vendors around Fenway Park was a treat never experienced watching at home. Inside, and sitting that close to the edge of the field, you could see 5 o’clock shadow on some batters in the on deck circle. The game was not a sellout, so it wasn’t broadcast. Later at Cheers, and to our complete surprise, the game was being tape delay broadcast in the bar. From the outfield camera we could clearly see ourselves behind home plate on every pitch! After yelling “There we are!” about ten times and catching a few annoying glances, we settled back and quietly enjoyed the game a second time. Our fellow patrons obviously knew we were from away, just not a million miles away from Derby, Maine and 1959.